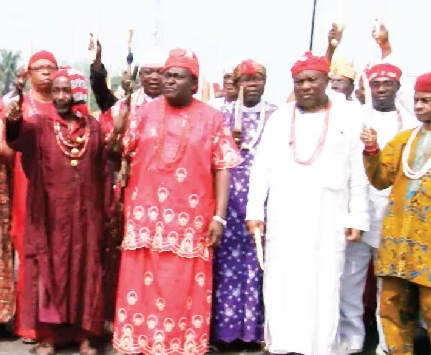 Imo State royal fathers on Tuesday marched the streets of Owerri in a solemn procession over the frequent abduction of traditional rulers in the state. 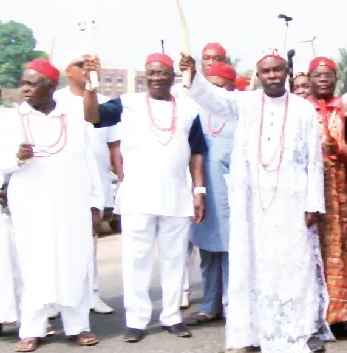 The procession, which ended with invocation of the gods and pronouncement of curses on the criminals who kidnapped the traditional ruler of Nguru Nweafor kingdom in Aboh Mbaise, Eze Oswald Anyanwu on January 29. In a statement issued after the exercise and signed by Eze Chidume Okoro and Eze Morrison Eke, chairman and secretary of the Council of Traditional Rulers, Owerri zone, the monarchs observed that the abduction of Eze Oswald Anyanwu added to the list of monarchs kidnapped in the last few years. The statement said it “now looks like a declaration of war against the revered traditional institution and the foundation of our cultural heritage”. “Monarchs are united in our total condemnation, in the strongest terms of this dastardly act of abomination which desecrates the revered traditional institution. Handcuffing, blindfolding and throwing monarchs into car booths for whatever purpose, desecrates the land and this is responsible for the denials, failures and rejections Ndigbo face at various levels in the society,” the monarchs added. “The entire monarchs in Owerri zone will today serve kidnappers in Imo state the ‘first course’ of the ‘fury of a king’. They also warned criminals in the state to desist from abducting or harassing monarchs or any member of a royal family in the state. THIS CAURSE WOULD NOT WORK UNTIL YOU ADD ALL YOUR SONS AND BROTHERS WHO HAVE BECOME CRIMINALS ALL OVER THE WORLD!! MAKING THE WORLD HATE AND REJECT NIGERIANS… SOME OF YOUR SONS AND BROTHERS ARE OVER HEAR DOING NOTHING BUT LOOKING FOR WHAT TO STEAL AND DEFRAUD!. YOU PEOPLE HAVE TO CAUSE THAT GENE AND BLOOD IN ****** SYSTEM SO THAT THEY CAN STOP ARMRUBBERY TOO, NOT ONLY KIDNAPPING.. NOW YOU KNOW THAT YOU ARE NOT SAVE LIVING IN YOUR CRIMINAL BIAFRANS ANYMORE…. When some of the monarchs are being kidnapped, they felt threatened. But over the years, ordinary citizens has been bearing the brunt and the pains of the kidnappers. I called this hypocrisy of the highest order. Mark, I don’t just get u.
Mr. Mark Abiodun, thank you. Mark you are correct. It is now that monarchs are being kidnapped that the so called royal fathers have come out to condemn kidnapping. What have they been doing when others that are not monarchs are being kidnapped? Their curse will not work until they include the kidnapping of other people that are not monarchs and other vices prevalent in the society. And as for idiotic Rapo, we all know your hatred for Ibo people but look at yourself first before condemning the Ibos. Look inward to your tribe before you rain curses on the Ibos. Do you know what they are doing here in the United States and are in jail? Do you hear what they are doing across Europe? Rapo, be careful. Kidnapping is bad….whether the victim is from a royal family or not. Selfishness, they are warning the criminals to stop harassing monarchs and the rest of their family members. What becomes of people with no royal blood or in no connection with monarchs. They should die for all you care. I thank God that men are not God, if not this world would have been a living hell.